In my last entry I wrote about the elections in Russia and in the US. The purpose was to give ideas (in general) about what the election meant for Russian and American relations per my perceptions here in a small city in Russia. This present entry is more for those also interested in the practical dimensions of life in Russia as we face the coming winter. My family and I moved here just over six months ago, and now the Russian winter and the “holiday season” are approaching. Those elicit various emotions and plans on how we are continuing to adjust. So how is our “mixed” Russian/American family adjusting and how can this help those who are considering coming to Russia or those who just like to learn about what life is like here. When I told people we were moving (back) to Russia the most common response was usually a question or comment about the climate. Does it really get that cold? How does someone from South Carolina survive there? Why does one from such a great climate like South Carolina even consider giving it up for Russia? I was raised where the summers were long and the winters were mild. We sometimes got snow in the winter, and sometimes we didn’t. Winter days were often bright, sunny, and not all that cold—at least not for long periods of time. Here in the Leningrad Oblast of Russia winter gets a head start on the December 21 official start of winter. The first snow started falling here the last week of October. The first week or so of November we had fairly deep snow. Then it warmed up to the mid to upper 30s (3-4 degress C) and most of it melted. Since then snow has been on the ground most days. Temperatures sometimes get above freezing, but that’s not good news. That is when the snow melts some and you have to walk in a muddy mush. So I prefer it to stay a bit under freezing. Today it is 23 F (-5 C), but we did get some sunshine. So I offer a few observations on how one raised in the American south deals with Russian winters. First, I tell myself that “it is Russia” frequently. What did I expect? In SC if it got really cold, you would just hang on because in a couple of days or a week there would usually be a warmer break. There are no real “breaks” in the cold in a Russian winter, although some days are worse than others of course. For people in the US raised in colder climates the adjustment would perhaps not be so radical, but for me it has been a “learning curve.” And I’ve lived here over three years counting our time in St. Petersburg! Obviously, dressing warmly is a first priority. I thought it got cold when I lived near D.C., but “Russia cold” is a different dimension. Good winter clothes are readily available here in Russia. Make sure you have good boots! Then there is the obvious: heavy coat, two to three layers under that, etc. Then, we make sure we take vitamins, especially vitamin D. And despite the cold, we try to get out and walk as much as possible. Of course, the problem with going out as a family is it is a time consuming pain to get everyone ready. Make sure everyone has the right socks, boots, shirts, coats, etc., and then dressing a two year old is a monumental task that, frankly, my wife usually does. Pulling the covers up over your head in the mornings and staying in the apartment is the easiest, but not the best, response to the Russian winter. Sickness is a part of life in the Russian winter. You probably are not going to make it through the winter without colds and flu making at least one “run” through the family. You have to accept the fact that the cold here in winter can be dangerous. A couple of weeks ago I came down with a cold. We had to make a trip to Riga, Latvia that week because of my visa renewal. I did not take my heaviest coat. I had checked the weather forecast and packed accordingly, but it turned much colder than the weather forecast predicted with continuous snow. We were outside walking around looking at the beautiful city and then spent all Sunday afternoon at the zoo. We enjoyed it, but I ended up feeling terrible with a horrible cough. I tried to go back to teaching, but after another week I finally gave in and Oksana called the doctor. He thinks I have pneumonia, although the radiologist said he thinks there is infection but it is not clear that it is pneumonia. Both agreed I need to be on strong antibiotics as well as other meds. I should have not gone out in the cold when I realized I did not have sufficient clothes. I should not have gone back to the school and my normal activities before taking care of my illness. I should have called the doctor when the cough kept getting worse. You don’t “challenge” Russian winters with your toughness. Just ask Napoleon or Hitler—or me! You would think I would have learned that by now. While you can mollify somewhat the problems with the cold with appropriate clothing, there is nothing you can do about the winter clouds. I can’t speak for everywhere in Russia, but where we live in northwest Russia you do not see the sun very much in the winter. I saw the sun for the first time in a week today. Sunny days are not frequent, but even when the sun does shine, it does not last long. We are not too far from the Gulf of Finland, so maybe it is the humidity and currents. Further, official sunrise was 9:49 am today, and sunset is 4:05 this evening. This is not to say the cold is not hard to endure. But the combination of clouds and cold makes seasonal depression a real problem. And I am not speaking of just us “foreigners.” Many Russians confess they hate the depression that comes from lack of sunshine and constant cold. My wife and I both realized that our “moods” were much gloomier recently. I don’t mean that kind of clinical depression that leaves you suicidal. You just lose the cheeriness, and your system seems to slow down and even small tasks seem monumental sometimes. You have to accept that and talk about it. Also, we believe diet is important. Vitamin D supplements and as many green vegetables as possible are needed. Interaction with others is also helpful. Understanding that this is often a part of life here is the first step. Then you formulate a “battle plan” with your family to combat it. Every family differs in how they can best survive and even thrive in the Russian winters. Now that the holidays are upon us there is the added dimension to life without family and friends in America. Holidays are a great time of sharing joy; they are also a time when we feel the absence of those who are not with us for whatever reason. I remember the first Christmas after my dad died. We had a really good Christmas with a lot of joy, but I felt his absense more strongly than I had up to that point. There is that “spirit of joy” in the air during these holidays in America. Thanksgiving was always when “the holiday season” seemed to begin officially. When we moved to America, Thanksgiving quickly became my wife’s favorite American holiday, because she said she did not know of anything equivalent to it in her country. It is not commemorating special national events, battles fought, or wars won like Independence Day (US) or Victory Day (Russia); it is not specifically to commemorate a religious event, like Christmas or Easter. It is “religious” in the sense it is the day our nation long ago sat aside to thank God for the blessings the country has received. Of course, Thanksgiving, like Christmas or any holiday, can be corrupted by the excesses of individualism and capitalism (Black Friday here we come! ), but that doesn’t mean it has to be. Families get together and reflect on their blessings from God. Here in Russia this year, however, Thanksgiving Day was a work day for us. So what did we do? We had a late supper eating Turkey, potatoes, cranberry sauce (homemade), and cake. And we thanked God for blessing us in Russia. It wasn’t like the big feast we had with our extended family in America, but it was the best we could do. Christmas here is not until January 7, and it is solely a religious observance. The gift giving and parties happen at New Years. In the days leading up to Christmas back in America we usually went to more than one party or meal at someone’s home. We never were big into the “Santa” thing so that is no big deal to us, and they have “Ded Moroz” (Grandfather Frost) here in Russia at New Years. We will still miss riding up to the “farm” above our home in Greer, SC and looking at The Turner Christmas Lights. Our family loved that. Then we would come back and walk around our neighborhood and look at how the different houses were decorated. While we have great Christmas memories of our time in America, we also realize how memory can often just bring to mind all the good things you had in the past that you do not have now. The good ol’ days were often not as good as we recall. We will remember the good about Christmas in America, but we won’t forget the materialism that seemed lurking around every corner. While in America, we loved going to parties and having friends over and exchanging gifts and singing. We, like many Americans, were also burdened with the financial concerns and stresses the holidays left us, however. There is that subtle competitiveness about gifts that creeps in. Frankly, Christmas strained our limited budget, and I know we are not alone in that! We live debt free in Russia. We will share some small gifts with the kids and send gifts to family in America. But we will not have to worry about the credit card bills that come in January and February that would set our budget behind so far. We’ll get together with family and friends for New Years, and there will be big parties. Then we plan on observing the Christian holiday that commemorates the incarnation of Jesus the Christ on Russian Christmas quietly in a house of worship. Since we have been here over six months we’ve had to adjust to other aspects of life. After you’ve been here for several months, as someone (can’t remember who) said to me some time ago, “It’s like watching people (back home) get over your funeral.” When you leave the country there are a lot of words of support and affection, and folks really do hate to see you go. But then they get on with their lives. You’ve moved and you may have been a very important part of their social lives, but they have to return to their routine. I think our experience is fairly typical. You continue to hear from some friends and family members, but with others you just fall off their radar. Some people just do not write e-mails or make phone calls. We still treasure communication from our American family and friends, but we have to focus on how to adjust to life here and now. It takes effort to establish relationships in Russia, and you cannot be taking constant trips down memory lane and adjust well. With e-mails, Skype, FB, and a host of other social media if people want to stay in touch they will. If they don’t then that’s a choice no one else can control. I have mentioned before the interest Russian people tend to have in people from the West. They want to get to meet you and learn about you. Nevertheless, building true friendships takes time—especially in Russia where people can be rather suspicious of strangers initially. After they get to know you and trust you then they will become friends like you never had. But a cultural difference is Russians tend not to form superficial relationships. They “size you up.” Once that trust and friendship is established, you can ask them for help in any area of life. But, again, that takes time. For us, that was cushioned somewhat by the fact my wife’s family was already here. So we knew some people from before. Still there was that time of readjustment for us. When you arrive here there is excitement at being in a new place, a new country, so much to see and do. Over time, however, there is the reality that the old friends are not here and e-mails and facebook can only do so much. It’s only natural that e-mails from America become less frequent. You look for new friends here, but it cannot be hurried. Again, friendship in Russia is very important, and you don’t become friends overnight….or over a month! A friend here is someone very close who you can trust completely. So I think it is important to ask whether the “pay off” is enough for living in Russia. I have tried to paint a picture that includes the negatives of living here. At the same time, I have commented all along that there are things about living here that I have gained which I cannot imagine having lived my life without. There is something about being around different people from a different culture who speak a different language that, while sometimes frustrating, enriches one’s life and has helped me to see the narrowness of my own views beforehand. You realize it is not the material things that give joy and depth to life. For example, we really miss our car, but not because of having access to transportation. We don’t miss the vehicle itself. We miss the family times spent together chatting or singing in that car. We can still do that without having a car, but the chatting and singing still need to be present and you have to be more intentional about it. Further, there has been an intrinsic reward in realizing Russians and life in Russia is not at all like the way it is portrayed in America. I’ve given up on main stream reporters presenting anything like an accurate picture. Life here, as I may have said before, is just “closer to the earth” with far less pretense. And sometimes life is just funny here. You see some things and think, “Hmmm…only in Russia.” Visiting here or taking a tour would have opened me up some to that discovery, but living here gives a depth to it not possible otherwise. When I go to the market I see people doing business differently; going to church reveals people who exercise their right to worship differently; having chats at parties reveals the stories of people far beyond what I could have read about if I had stayed in America. An example from this past weekend, I was sitting across from Vitaly, whom I had just met, at a birthday party. As the party wore on we chatted and laughed. He had just come here from working in a Ukrainian coal mine in Luhansk for five years. Here we were joking around about our countries and sharing stories on how to get Russian citizenship. So it is not that the cultural divides or ways of seeing things are not there. But life here is for people who like hearing from others from “the other side” and realizing those people really love it when they hear your story–because they really are interested in you. It creates a different kind of friend. Being here in Russia as winter and the holidays approach comes with a cost. 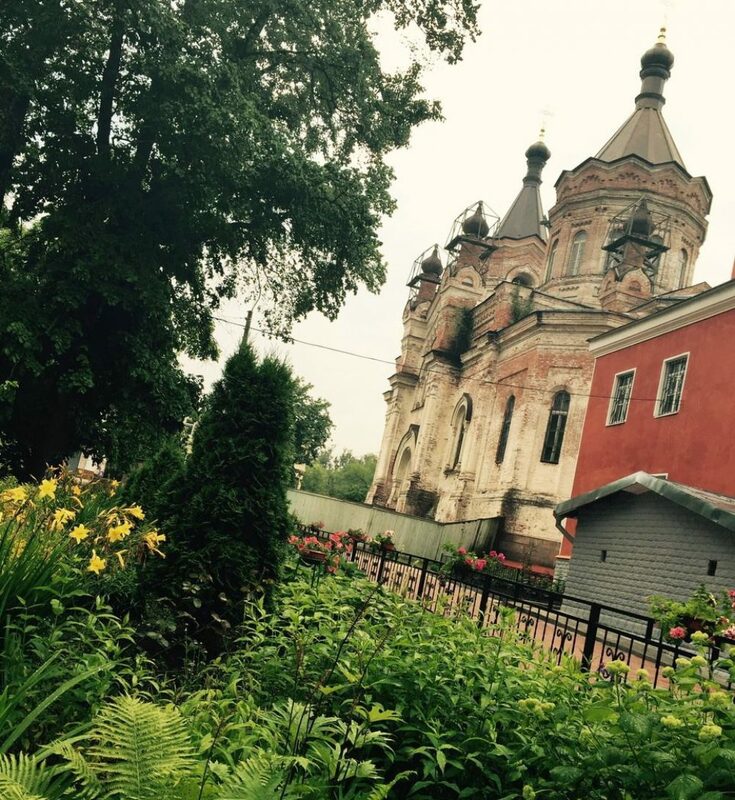 I’ve already blogged about why we came to Russia. But at some point you ask yourself why do we stay. It has brought about so many changes in our lives. But change happens anyway. Life would not be the same in America if we had stayed in America. Some family and friends will move away. Friendships change, evolve; situations change; kids get older. If we stayed in America I’d probably be whining for the days when the kids were younger—or easier. That is just human nature. We look forward to what is ahead of us in Russia. ADDENDUM ON HEALTH CARE: I want to add a comment about my sickness and the care I received. As I mentioned it was my fault I did not seek help sooner. A friend of ours recommended a good doctor and Oksana called him. He could not see me that day, but said he could come by the next morning. They still make house calls in Russia! The price was double: he charged us $20 for his visit. He spent a lot of time with me and pretty much gave me a physical. He asked about my past health issues, surgeries, medications, etc. He was concerned I have been on anti-reflux medication for so long without a thorough inspection of my esophagus, but he said we would deal with my current problem now and talk about that later. As I said he was very concerned about my breathing and believed it was pneumonia, although he sent me for a chest and head x-ray. He tapped some places on my skull that were sensitive without me even realizing it beforehand. He also scheduled his nurse to come out in the evening to take blood and urine samples. He prescribed a number of medications, especially a strong antibiotic for all the infection I have. I am suspicious of antibiotics and do not like taking them. Without me mentioning that, he prescribed two other medications (a pro-biotic and an enzyme) to counteract what he said are the negative impact of antibiotics on our systems. I was very impressed that he was the one who brought up the “downside” to antibiotics. I have never had an American doctor mention that issue. We were treated very well at the hospital where they took my x-rays. It was very modern, clean and everyone was very professional and kind. They thoroughly explained what they did and what they found. Then today the doctor called back to check on me and to reassure us it would take a few days for the medicines to reach full effect. For the doctor’s house call, the nurse coming out to take my samples, the x-rays and conference afterwards and the medications our cost was just a little over $100. We could not have been more pleased with the care I received. This fall both Russia and the United States held their national elections. So I decided to devote another entry to the political issues related to living “between” the two countries. The Russian election was a parliamentary election only, and it occurred on September 18. The US election, however, was for the presidency, as well as a number of House and Senate seats. Thus, the American election drew far more global attention. My purpose here is not a full fledged analysis of either election. I will focus on those aspects of the elections which may better inform the relationship of Russia and the United States. So I’m not going to deal witth Trump’s proposed wall with Mexico or who he may or may not appoint to the Surpreme Court or other domestic issues unrelated to a relationship with Russia. THE RUSSIAN ELECTION. After the election I scanned the news for the observations of persons whom I know have far more experience in and knowledge of Russian politics than I. I have my ideas from reading and listening to news both in Russia and the US, but I do not pretend to understand the intricasies of Russian politics. The first article that caught my attention was by Gilbert Doctorow, whom I have mentioned before. Doctorow’s article addressed the issue of why his predictions about the Russian election were wrong. Now, if the NY Times or the Washington Post gets Russia wrong I don’t pay it much attention, although I don’t recall they have ever actually admitted getting anything wrong about Russia. Gilbert Doctorow has spent a career working in Russia and a lot of time studying Russia. He continues to travel to the country frequently. If he gets something wrong, then it is newsworthy, and thankfully he is confident enough and honest enough to state simply he was wrong and evaluate why. He believed United Russia, the party of President Putin, would lose its majority in the lower house. He was not alone; many astute observers within Russia predicted United Russia would get between 30-40% of the popular vote. United Russia got about 55% of the popular vote. The next two contenders were the Liberal Democratic Party of Russia which received about 13.5% and the Communist Party of the Russian Federation which received just over 13%. Another party, Just Russia, got about 6%, and the other parties did not receive the necessary 5% to receive any representation. In other words, no party came close to United Russia in the popular vote. Further, the election was declared a clean one by almost all observers, and the usual suggestions of voter fraud were not forthcoming. Even the New York Times admitted it was a fair election stating, “Over all, analysts said, the Kremlin seemed to have kept its word to run a clean race.” Why were the prognosticators wrong about the results? I would like to elaborate on the first two reasons Doctorow mentioned that he says led to his incorrect prediction and, I think, the reason others missed being accurate as well. Now that we all have the advantage of hindsight, what can we learn? First, he thought the populace would “punish” United Russia for lacking the strong nationalistic and populist themes of the Liberal Democrats and the Communists. Many believed United Russia would not be seen as strong defenders of Russian interests and reputation by comparison. While many in the West think Putin and his party are a bunch of chest thumping nationalists, this is not the perception I have gotten from living in Russia. I have found Putin comes across more cerebral, and his language is usually non-confrontational when talking about the West. Putin rarely uses demeaning or unkind language when addressing his differences with the West, despite the fact he has been compared to Hitler by Hillary Clinton and called a “thug” by more than one American politician. Russians are well aware of what American leaders say about Russia, and they know how unkind and undiplomatic they can be. For example, a collection of a few descriptions of Russia by Barack Obama. Notwithstanding the fact that some of what Obama said in those quotes was just plain wrong, it would not be hard to understand why pundits might think that many Russians would hope for an abrasive and confrontational response from its leader to such condescending and deceitful remarks by the President of the United States. Surprisingly, Putin does not allow such comments to elicit emotional reactions and responses. In the press conferences I have seen he is very clear, strong, and logical in his responses. He does not “roll over,” but he does not resort to the vitriol or drama of the American leaders. The election and recent high approval ratings of Putin show that the majority of the Russian people did not allow their frustrations with America’s name-calling politicians to make them vote for another party. Second, Doctorow said that even though he did not write about the economic situation prior to the election he really believed that the fact that Russia is technically in a recession and purchasing power is down 8% would cause a majority of Russians to vote for another party. Now, Doctorow’s understanding of economic factors far exceeds mine. There is no question that his analyses are correct. But my observation from life here is that Russians are used to tough times, especially those who lived through the fall of Communism and the “reign” of Boris Yeltsin. Russians also realize the sanctions, while limited in their effectiveness, came along roughly at about the same time as a severe drop in oil prices which had a clear and unavoidable negative impact on the Russian economy. They do not blame Putin for these problems. The annexation of Crimea, ostensibly the reason for the sanctions, was based on the fact an overwhelming majority of Crimeans wanted Crimea annexed. It actually made the economic situation in Russia worse because of the cost involved after Ukraine had left things in such terrible economic shape. But Putin could not risk losing significant military bases in Crimea if Ukraine did join NATO. Further, the radicals and neo-Nazis in Kiev dispise fellow Ukrainians who still speak, worship, and live consistently with their Russian backgrounds. Most Crimeans, as polls show, really consider themselves Russians. Putin did not want to leave Crimeans to these radicals. And on the specific issue of the Russian economy, while Russia is in a recession, the economy is clearly healthier by far than when Putin became President in 2000. Overall, my observation is that Russians look at the longer picture. Their relationship with Putin is not of the “what have you done for me lately” variety. Unlike what sometimes happens in the West the citizens here do not hold the President responsible for everything that happens to the economy. The point here for understanding relations with the West is that the Russian people gave clear support to the party in power despite the strong attempts of the West to leave Russia isolated and in economic shambles. Based on some of Obama’s comments, I believe he really did think that the negative impact of the sanctions would be so clear and undeniable that the Russian people would rise up and oust Vladimir Putin and his party. The latest elections show that this scenario was a long way from reality. The truth is Europe is far less likely to follow the lead of the United States in the future, because following the US on the sanctions did not work out well for them. Obama referred to the US and its European “allies” as standing strong and united. Patrick Buchanan has written recently on the fact we must come to grips with very different alignments in Europe now. With the “old guard” departure of leaders in the UK, France, Italy and perhaps even in Germany next year, the US will clearly have far less influence in Europe. Russia is still standing pretty strong behind its government, but the same cannot be said of the feelings of many European countries for the US. THE ELECTION IN THE UNITED STATES. While the results of the Duma elections in Russia were a bit of a surprise, those results were nothing compared to the shock at seeing Donald Trump elected President of the United States. I was asleep here in Russia when the evening began in the US, but I was told by family and friends that when the 6:00 news came on there no networks were predicting a Trump victory or even a close race. Again, my purpose here is not to analyze the Trump victory or to predict all that he will or will not do when he does become President. I’m not qualified to render such a broad analysis. I do, however, want to comment on what I think his election means for the future of Amerian/Russian relations. Again, I first look to those who know more than I do for the “bigger picture,” and then comment on how this filters down to one who lives and moves about within this small Russian city. I have already mentioned Gilbert Doctorow, and in previous blogs I have referred to Stephen Cohen. I look to them because both of them have spent their careers studying Russia. They carry on the best of “mature scholarship.” More than just the advantage of age and experience, they do not need acceptance in the academic or professional media circles anymore. They can, pardon the cliché, “call ’em as they see ’em.” Cohen was recently asked why almost no one else who writes or comments on Russia agrees with him. His reponse was that there are those who do agree in private, but they need acceptance in the professional societies and circles, and if you say something outside the “mainstream consensus,” such as to claim Putin is not demonic, then you are regarded as a “stooge” or propagandist for Russia. I did a quick i-net search and immediately saw Cohen listed as “Putin’s apologist,” and “Putin’s best friend” (under the subtitle: Useful Idiot). Both Doctorow and Cohen were “cautiously optimistic” in the evaluation of what a Trump presidency will mean for Russian/American relations. Both expressed frustration at Trump’s lack of consistency and the difficulty of seeing his “big picture” because his statements are often contradictory or mutually exclusive. Doctorow pointed out this is not unusual when looking at statements of an American politician running for office—especially if there is no record to defend or explain. In other words, all politicians engage in political pandering. No shocker there. He did, however, make a very important point for analyzing Trump’s pre-election statements. He recommended looking at statements, which the politician, in this case Trump, made during the campaign that he knew would result in criticism and would gain him few votes. So what did Donald Trump say that would meet these criteria? He was asked in this interview if he could convince Putin to get rid of Bashar al-Assad in Syria. To which he said he didn’t think he wanted to. Assad is no “baby,” said Trump, but who do we think would take over control of Syria. Who is the “good guy” we have in mind? He keeps terrorists who murder and torture even children at bay. He went on to say he would be willing to work with Russia in getting rid of ISIS (and other such groups). The interviewer quickly asserted that Putin is “hitting” people we support. Trump’s response was to ask why do we support them. Why do we send weapons to these people we know nothing about other than they do not like Assad? We have no idea who we are supporting and who we are arming. Clearly these responses are by someone who sees through the excuses the US makes for regime change. This is not pandering for votes. Pointing out that our actions against Hussein and Gaddafi were ill conceived, and that our opposition to Assad has no “forethought” to it, and expressing his willingness to work with Putin and Russia clearly will not win Trump support among the establishment Washington politicans—Republican or Democrat. This was the cause of both Doctorow’s and Cohen’s optimism. They both, like a lot of us, would like to hear a more consistent and clearer policy from him, however. Cohen also pointed out in his podcast after the election that another reason for concern is Trump will face opposition from both parties if he tries to implement policies that move away from the position that the US has the right to work for the overthrow of any leader the Military Industrial Complex and the political establishment deems unacceptable. Assad is the democratically elected President of Syria. He is an Alawite Muslim, which means he comes from the minority group in Syria. Sunnis make up about 74%, whereas the Alawites make up only about 13%. Hence Assad has kept Syria more “secular.” As Trump said, he is not a “baby,” not a gentle person. He has been more than harsh in dealing with opposition. But Trump’s point that a gentle person would not last long as the leader of Syria is simply overlooked by most in Washington, because Assad has not been friendly toward the United States. Cohen points out the opposition comes from both Republicans like Lindsey Graham and John McCain on the Republican side and a host of Democrats who supported Hillary Clinton. Most of what Graham and McCain say is so similar to what Clinton said during her campaign it is hard to believe they actually belong to different political parties. Further, leading news outlets like the New York Times and the Washington Post joined in the renewed McCarthyism. Some of it was ideological, but as Paul Robinson pointed out, some of it is just lazy journalism. Many reporters from major outlets who write about Russia do not take time to familiarize themselves well with Russia. It is a big and complicated country. Many articles clearly show an ignorance of the country and the people that one who has lived here can easily spot. And then there is the “herd mentality.” It is easier to go with the flow than to do hard research that takes you out of the mainstream. Again, Russians are aware of what is written and said about them in the West. So the fact that both The Times and The Post, who do not like Russia, also do not like Donald Trump was seen as a positive for Trump in the minds of many Russians. The other reaction I got here were the questions on why there was rioting, complaining, and so much angst after Trump’s victory. What were the rioters trying to accomplish with their violence against other persons and property? I had and I have no answer. People did not get their way and they expressed it through violence. I hate giving that kind of answer, because it obviously does not make American citizens look very mature. I love my country, and I know for the better part of my life most Americans accepted disappointments and moved on. Yet now that virtue is being lost. The “picture” of America that is being sent around the world is an ugly one—violent, self absorbed, and impossible to please. I have seen bitter political fights, but never the senseless violence. Now Trump’s every move seems to be questioned by Democrats, establishment Republicans and even those who did not want Clinton. I do not know what kind of president he will make. I can say from this side of “the pond” that many see Americans as a people who chose a leader then condemned him to failure before he even began. As an aside, I will (again) address the question or the suggestion I get often that Putin has a plan to restore the old Soviet Union or at least expand the borders of Russia as close as he can to those of the USSR. I cannot say what goes on inside the Kremlin. I do not claim to know Vladimir Putin’s motives or plans. I can only judge based on what I see and read here on the news and what I sense in talking to Russians. This attitude that Putin has a secret (or not-so-secret) aim to take over the Baltic states or Ukraine or re-establish the old Soviet boundaries seems very inconsistent with what I see and hear here in Russia. I don’t know anyone here who thinks like that, and there is nothing in the news that indicates Putin is trying to stoke those flames. I would think that he would be sending out subtle messages to the public feeding the desires for a return to the old days if that was his plan. Statements like the one I quoted in an earlier blog that he frequently makes that “anyone who wants to restore the old Soviet Union has no brain” is not the way to lay the groundwork for restoring the Soviet Union or expanding the borders of Russia. Sure, there are people who still long for the old Soviet days. They are not, however, in the majority. There is a Communist Party here, and it got 13% of the vote as I said above. Many of them, however, just want Communism in Russia, not taking over the old Republics (countries). CONCLUSION. I will conclude with some evidence for hope for future relations and another observation on Putin. After the election of Donald Trump, a Levada Russian independent poll shows that 71% of Russians want rapproachment with the West. The mid-November poll showed a jump of 21% from July of last year. The only poll that has ever been higher was in 2000. Fifty-six percent still had a negative view of the West, probably based on all the negative things that were said about Russia in American press during our election. Russians clearly want things to be better, however. I sense this in daily conversations, not just polls taken by professionals. They simply do not see the same attitude from the West. Vladimir Putin is sometimes called a “semidesyatnik” by biographers. A semidesyatnik is a “person of the 70s.” It refers to those who “came of age” during that decade. It was toward the end of Leonid Brezhnev’s long rule of the Soviet Union. He was old and way past his prime, and most of the men in his government were as well. It was a stagnant time. For the ideology of Communism the proverbial bloom was off the rose. Putin, like many of his peers, seems to have been fiercely loyal to Russia, but not as committed to “the party” as his KGB credentials might suggest. The accusation or presumption that there lies within him a heart longing for the restoration of the USSR is, I think, way off the mark. I will offer a word from personal experience as to why I think this way. My father-in-law is also a semidesyatnik. As I have mentioned before he served a career in the Soviet army. In fact, he served five years in East Berlin at the same time Putin was there. On birthdays and holidays my in-laws often get together with some old army buddies and their wives. I get to come along because, well, I’m married to his daughter. Hearing their stories, I realize this is not a group who longs to restore the USSR. They were patriotic; they served their country, and they love their country. But they, too, saw the hollowness of the ideology they were raised on. It’s not that they hate Communism. They just see no reason to go back to it. I read an article recently on an interview John McCain gave in France. It was a rehashing of what amounts to his political threat toward Donald Tump to the effect that Trump better not try to work to improve relations with Russia. When I read John McCain ranting about Russia (he literally sputtered during the interview) and giving his psychoanalysis of Putin, the “KGB thug,” I realized it for the garbage it is. Maybe we should analyze John McCain. His grandfather and father were both 4 star Navy admirals. Of course, he got into the Naval Academy. His rank in class at graduation was 894 out of 899. Pity the five guys out of almost 900 who were dumber than he was. Unfortunately he will unite with his Republican soul-mate Lindsey Graham and the mainstream Democrats in an attempt to sabotage whatever attempts Trump makes to join with Russia in destroying ISIS and its kin once and for all. His threat is not an empty one. My hope is that America is ready to listen to wiser voices about Russia.